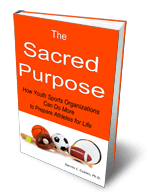 While most youth sports organizations publicly declare that their primary mission and purpose is youth development, they do little to achieve this result. Instead, most of them make a priority of helping volunteer coaches learn the sport and teach it to kids. In other words, there’s a huge opportunity to do more. For one thing, they don’t recognize that most volunteer coaches need to improve the way they interact with young people. Like all adults, the coaches have ingrained ways of dealing with others that can cause issues. To become effective mentors and achieve the higher purpose of youth sports, most coaches need to improve the way they communicate with young athletes. The book stresses the importance of the role of athletic coaches as a part of “the village” involved in helping young people prepare for adult life. For example, team sports are a tremendous opportunity to build character strengths. Also, the book identifies specific communication skills that coaches should focus on, explains why this aspect of coach development requires a concerted effort over time, and what youth sports organizations can do to fulfill their purpose.